Whatever the scenario, there are special challenges that will catch you off guard if you aren’t accustomed to running multiple passes. A few simple habits however, can prevent the high-speed, inadvertent transformation of valuable printed material into waste sheets. 1) The first pass through a folding machine might impart a slight curl to the sheet. This in turn can influence the register the second time through. It also makes it harder to feed. Generally this is a folding machine issue, but it can happen on scoring machines as well. If you encounter a curl problem, here are a few things you can try. Simply flip the sheet. An up or down curl might catch the edge of a deflector or roller. Flipping it over might eliminate the issue. Run a few test sheets to see if the register problem disappears. If it does, then be sure to move the scoring or creasing tools to the opposite shaft. Prevent or minimize the curl in the first place. Here’s a tip for folders that reduces or eliminates curl and improves register. The downside is that there are size limitations depending on your folding machine. You can download the tip here. Let the curl work for you. If the sheet already has a curl, run it through the folder on the first pass so the fold rollers remove the curl. In some cases you’ll end up with a perfectly flat sheet for the second pass. 2) If a scored piece is to be subsequently folded, check it in the folding machine. When you score and fold inline you get instant feedback if there’s a problem. So it’s obvious when to stop. Not so with two passes. But there is a workaround. Make the first score you run the same as the first fold in your folder. For example on a letter fold let’s say you plan to fold up into fold plate #1 and down into fold plate #2. On your first scoring pass, do the score for fold #1. Score a handful of sheets. Set your folder for fold #1 only, and then run the scored sheets through the folder to check position, register and quality. If the folding is done on another machine, repeat this process with the second score. In any event, make sure you test it on the folder before you run an entire scoring pass! 3) Check the register with every handful. To start with you should have “reference sheet” with the score or perforation lines marked exactly in the right position. A rule-out (lineup sheet) is helpful, but I’ve found it more accurate to have an actual sample cut to size and then marked. Then take one sheet periodically and compare it to your reference sheet. It’s also vitally important to check sheet-to-sheet register as you jog each lift from the delivery. Sight along the edge of the neatly jogged lift and any register problems will be readily visible. The photo at right exaggerates the effect. Yet anything that strays from a perfectly straight line as shown is an indication of a problem. When checking register in this manner, check both the leading edge AND trailing edge. It sounds like a lot of work but it's easy. Jog the lift, look at one side, flip it over and look at the other side. It soon becomes second nature. 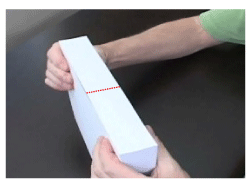 4) Be sure paper is trimmed consistently. Running in two passes is like shuffling a deck of cards. If there is any variation or other problem, it will be almost impossible to sort it out afterwards. If the lead edge of the sheet is roughed up or dinged, this too can cause problems. Set aside any problem sheets and deal with them separately. 5) A rough or deep perf can affect register on the second pass. If you’re running a combination of scores and perfs and you think the perf might be a problem, do the perforating pass last if at all possible. Or better yet, use a finer perforating blade or a micro perforating tool. If you have a way to flatten the perf as you are running, be sure to do it. Many perforating machines have a de-burring or flattening feature built in. On a folding machine, you might be able to flatten the perf if you have a 16pp right angle section or you have pre-slitter shafts. A note of caution from one who has been there and done it: do NOT flatten a lift of perfed sheets using the clamp in the guillotine cutter! This will just make them stick together when you go to feed them again. Yes, it requires a little more effort and care when running multiple passes on your folding and scoring machines. As with ALL post-press work, it pays to take a few minutes to think the job through to the end, well before you ever pick up that first sheet. Of course, you can also add additional Tri-Creasers and Micro Perforators to your arsenal so you have everything you need to accomplish the jobs in one pass. If you find yourselves experiencing the problems described above often and have interest in adding additional tools, please contact us at 973-383-7920 or Gina@TechnifoldUSA.com. We are always happy to try and help out our customer base and make their operations run more efficiently.